SHINE Pearl Digital, SHINE Champagne Digital, SHINE Silver Digital, DIGITAL Groove, DIGITAL Felt, CT Clear Digital HP 30#and CT Clear Digital HP 48# are certified for use on HP Indigo® digital presses. SAVOY Brilliant White Digital HP 118# Cover, SAVOY Natural White Digital HP 118# Cover and AVEO White Sugar Digital HP 118# are treated for HP Indigo® digital presses, but are too thick to achieve certification. 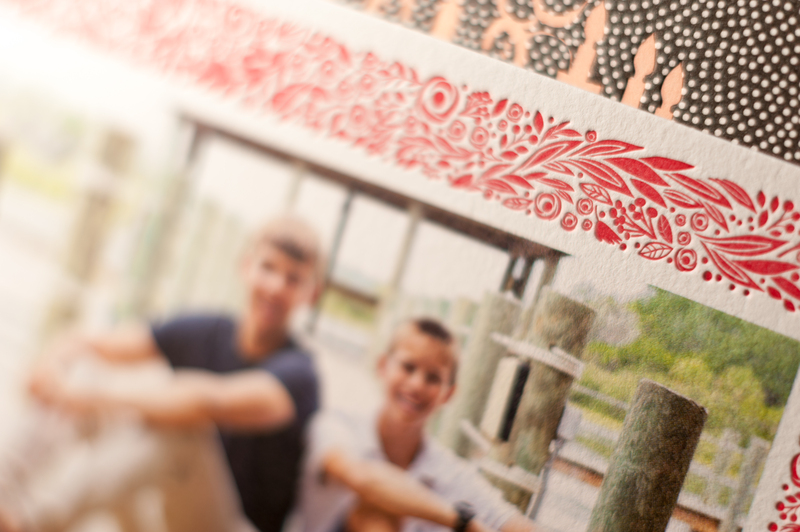 Standard versions of these products print beautifully on toner-based digital presses such as Xerox iGen®, Xerox DocuColor, Xerox 800/1000®, Kodak NexPress® and Konica Minolta® digital presses. We strongly recommend pre-testing on our specialty papers before purchasing. CT Clear Digital HP 30# and 48# are certified for use on HP Indigo digital presses. 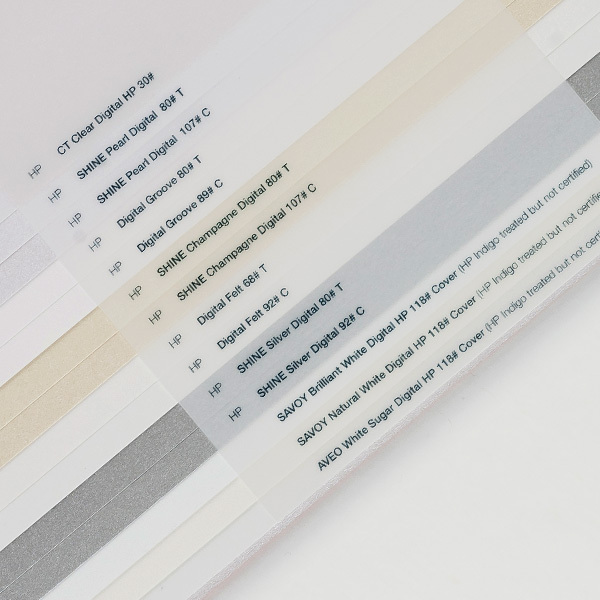 These papers not only have a special surface enhancement providing for better ink adhesion, they also have a one half inch printed strip on both the leading and trailing edge of the sheet to register with the optical sensors. This strip is intended to be cut off after this paper is printed. 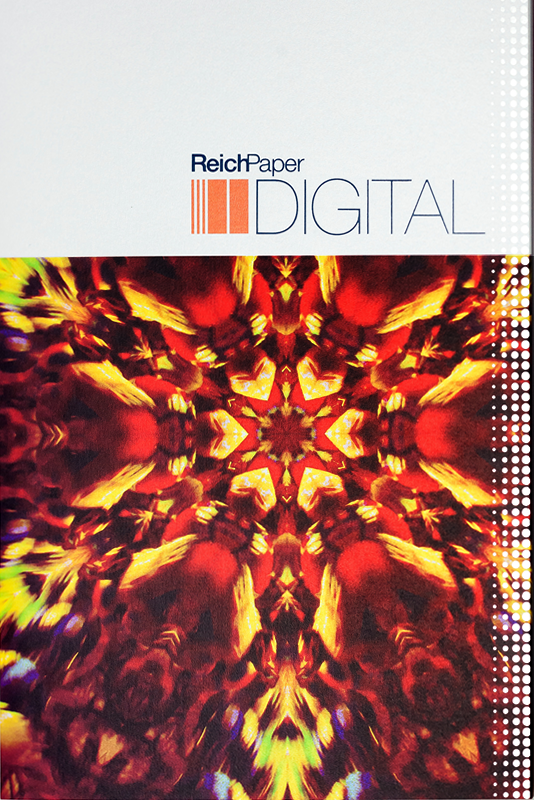 Although SAVOY Brilliant White Digital HP 118# Cover and SAVOY Natural White Digital HP 118# Cover are not certified for use on HP Indigo as they are too thick, they run beautifully on HP Indigo digital presses and are stocked in both 19 x 13 and 18 x 12 sizes. Caliper is a measure of the thickness of a sheet of paper (1 pt. = 1/1000 of an inch). Below is a list of basis weights and corresponding calipers for DIGITAL. All Reich Paper grades are manufactured to a basis-weight standard, not to caliper. Calipers here (and in our stock charts) are provided for reference, but may vary slightly from run to run, as is typical for any paper. If caliper is critical to your project, please contact us to discuss your requirements.